Let's make Indonesian snacks together! I would like to invite you to make some Indonesian snacks together. We will eat that with coffee, tee, capppucino or Wien or beer as you like. I will buy all ingredients and provide drinks. We just need to share the cost later on. If any of you want to stay longer and join for simple dinner are very welcome. 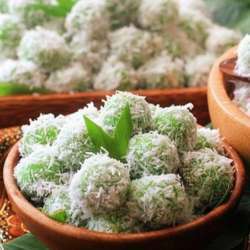 Klepon (pronounced Klê-pon) is a traditional green-coloured (natural color from pandan leaves) balls of rice cake filled with liquid palm sugar and coated in grated coconut. Lemper is an Indonesian savoury snack made of glutinous rice filled with seasoned shredded chicken, fish or abon (meat floss). The specific lemper filled with seasoned shredded chicken is called lemper ayam. The meat filling is rolled inside the rice, in a fashion similar to an egg roll; this is in turn rolled and wrapped inside a banana leaf. I am going to send you a message for confirmation and inform my address one day before. That will be very appreciated to not cancel in a short notice because some people are in the waiting list do not jump in the event if you cancel the day before. Thank you and I am very happy to welcome you to my place. I hope all of us will have a good time and learn to cook something different.